To Cite: Saeed U, Mazoor S, Jalal N, Zahid Piracha Z. Contemplating the Importance of Toll-like Receptors I and II Regarding Human Viral Pathogenesis, Jundishapur J Microbiol. 2015 ; 8(1):e13348. doi: 10.5812/jjm.13348. Background: Toll-like receptors (TLRs) play a major role in innate immunity, since they detect conserved pathogen-associated molecular patterns (PAMPs) on a range of microbes, including viruses, leading to innate immune activation and orchestration of the adaptive immune response. Objectives: The current study aimed to discuss earlier evidence implicating TLRs I and II in the innate immune response to viruses, in the light of more recent clinical data demonstrating that TLRs are important for anti-viral immunity in humans. Materials and Methods: A literature search was performed via accessing research articles from PakMediNet, Pubmed and Google Scholar with key words of Toll-like receptors I and II Regarding human viral pathogenesis. The valued information on the recent scientific horizons was subjected to critical analysis. Results: Comprehensive literature review illustrates important signaling pathways involved in TLR1/TLR2 mediated regulation of viral pathogenesis. TLRs mediated activation of apoptosis tends to contribute towards defense strategies utilized by innate immune response. Activation of antiviral TLR1-dependent signaling cascade would ultimately lead to activation of NF-kappa B which promotes antiviral responses via induction of specific genes. 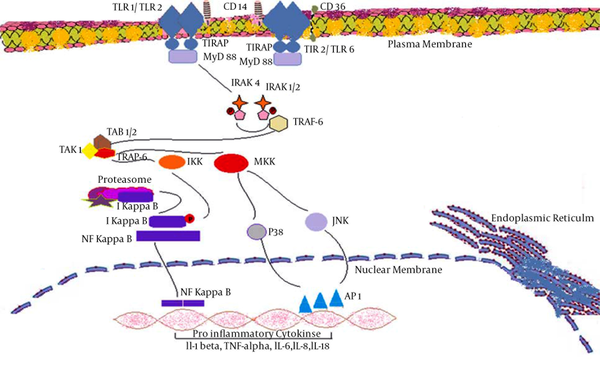 TLR1/TLR2 dimer generates intracellular signaling via IRAK4 mediated activation of IRAK1/2 which results in activation of NF-kappa B, p38 and JNK proteins in cytoplasm. 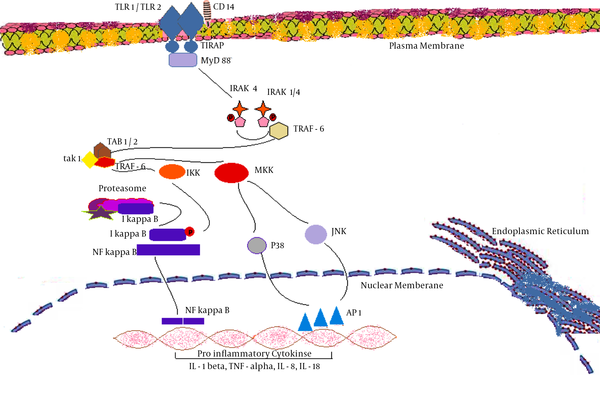 NF- kappa B, p38 and JNK enter the nucleus thereby causing activation of various pro-inflammatory cytokines such as IL-1 beta, TNF-alpha, IL-6, IL-8 and IL-18. Among the chronic HCV infection, the HCV core protein induces TNF-α and IL-10 from the macrophages thereby causing reduction in release of interferon alpha. Abnormal TLR1/TLR2 signaling may contribute to the enhancement of infection-related morbidity and mortality. Conclusions: To date, a large number of viruses are proved to trigger innate immunity via TLRs, suggesting that these receptors are likely to be important in the outcome of viral infection. This suggestion is supported by the observation that many viruses have evolved mechanisms not only to evade the innate immune system, but also to subvert it for the benefit of the virus. Viral infections are rising day by day worldwide and it is anticipated that shortly viruses would emerge as highly dangerous pathogens. Nature has also selected many viruses to destroy multiple bacterial or fungal pathogens (1-3). Nature has many hidden remedies against multiple diseases such as chronic inflammation, cancer and other various metabolic diseases. There is a strong need to identify therapeutic potentials of the natural entities. Several pathways associated with viral propagation could be blocked after designing the potential therapeutic inhibitors (4-8). Previously the authors' research group described the interactions of Hepatitis C virus proteins with the pattern of recognition receptors (9). It is interesting to determine the importance of TLRs I and II against several other viruses. The current study aimed to determine recent scientific horizons and contemplating viral pathogenesis with respect to TLRs I and II signaling. TLRs, the principal modulators of innate immune system, play a major role in the identification of foreign infections in mammals. These type 1 membrane spanning, pattern the recognition receptors and detect conserved products (pathogen associated molecular patterns) unique to microbial metabolism. TLRs are not only significant for innate immune activation but also important for adaptive immune responses. It has been reported that recognition of various microbial products by TLRs expressed on dendritic cells (DCs) usually triggers functional maturation thereby leading towards antigen-specific activation of adaptive immune responses (10). The current study aimed to discuss the evidence implicating TLRs I and II in the innate immune response to viruses, in light of more recent clinical data demonstrating that TLR I and II signaling are important for anti-viral immunity in humans. A literature search was performed via accessing research articles of the recent two decades from PakMediNet, Pubmed and Google Scholar with Toll-like receptors towards human viral pathogenesis key words. The information was subjected to short communication after critical analysis of the previous studies. Multiple viruses are reported to activate the innate immune system through TLRs which suggests that these TLRs are likely to be associated with the outcome of viral infections. Most of the viruses have evolved themselves not only to escape from innate immune system, but also to subvert it for gaining replication advantage (11). TLRs results into activation of NF-κB pathway, which ultimately promotes cytokine production, through multiple adaptor molecules such as TIR-domain-containing adapter-inducing interferon-β (TRIF), MyD88 and TIRAP/ MyD88-like adapter (Mal). NF-kB pathway activation primarily links both the primary and secondary immune responses through production of various inflammatory cytokines such as TNF alpha, IL-12, IL-8, IL-6, IL-1, chemokines and induction of co-stimulatory molecules including CD40, CD86 and CD80. MyD88 tends to bind FADD and thereby promoting apoptosis via Caspase cascade. Therefore TLRs mediated activation of apoptosis tends to contribute to defense strategies utilized by the innate immune response. Among the thirteen different types of TLRs, the members involved in responses to viral infections are TLR1, TLR2, TLR3, TLR4, TLR6, TLR7, TLR8 and TLR9 (12). TLR 1 gets associated with TLR 2 in order to develop heterodimers. TLR1 was initially recognized as Toll in Drosophila and possibly involved in the development of mammals. Prior to TIL discovery, a molecule possessing significant association with mammalian immune system was recognized and termed interleukin-1 (IL-1) receptor. On the basis of cytoplasmic portions, it was identified that the molecule had approximate homology towards drosophila Toll (13). TLR1 (of approximately 786 amino acid proteins) participates in the innate immune response to microbial agents. It cooperates with TLR2 in order to mediate the innate immune response towards bacterial lipoproteins or lip peptides. TLR1 utilizes MyD88/MAL and TRAF6 adapter molecules for ligand specific signal transduction. TLR1 signal transduction usually leads to NF-kappa-B activation, generation of inflammatory response and production of cytokines. It is reported that TLR1 is ubiquitous and its high expression is found in spleen, thymus peripheral blood leukocytes, small intestine, and ovary (14). Some of the alternative names associated with TLR1 include: Toll-like receptor 1, TIL, rsc786, Toll/interleukin-1 receptor-like protein, CD281, DKFZp547I0610, KIAA0012, DKFZp564I0682, MGC126312, MGC126311 and MGC104956 (15). TLR 1 gets associated with TLR2 in order to develop heterodimers. TLR1s are located on cell surface of monocytes/macrophages, a subset of dendritic cells and B lymphocytes. According to Jin et al. TLR1-TLR2 heterodimer formation promotes intracellular cytoplasmic Toll-interleukin (IL)-1 receptor-resistance (TIR) domains to come close thereby promoting dimerization and initiation of intracellular signaling. Extensive hydrophobic interactions and hydrogen-bonding between TLR1 and TLR2 tend to further stabilize heterodimer (16). TLR1 usually recognizes multiple peptidoglycan and (triacyl) lipoproteins. It was reported that TLR1, TLR2 and TLR2, TLR6 exist as heterodimers on the surface of cell and recognize multiple triacylated lip peptides and diacylated lipoproteins of bacterial origin (17). According to Daley et al. TLR1 variant (rs4543123) was found to be associated with multiple viruses such as Para influenza virus and respiratory syncytial virus (18). TLR1 and TLR2 hetrodimer recognizes the envelop proteins of Human Cytomegalovirus (HCMV and lead to releasing pro-inflammatory cytokines (11). Chang et al. reported that TLR1 and TLR6 are associated with TLR2-mediated macrophage activation via core and NS3 proteins of hepatitis C virus (HCV) (19). It was further investigated in human cells that TLR1 or TLR6 deficient cells result in signiﬁcant cytokine reduction upon HCV protein stimulation. This suggests that in macrophages, TLR2 exploits either TLR1 or TLR6 in innate immune recognition of HCV proteins. Toll like Receptor II (TLR2 of approximately 784 amino acids) normally exists on the surface of cells. TLR2s are mostly found on monocytes/macrophages, myeloid dendritic cells, and mast cells. These TLRs generally utilize MyD88/MAL adapter molecules. TLR2 ligands include; multiple ligands such as glycolipids, lipopeptides, lipoproteins, lipoteichoic acid, heat shock proteins (Hsp70), and zymosan (Beta glucan) (22). TLR2s are highly expressed in particular in monocytes, peripheral blood leukocytes, bone marrow, lymph nodes, and spleens. These TLRs are also found in fetal livers and lungs. While in other tissues TLR2 levels are comparatively low. TLRs, after their expression, experience post-translational modification. It is observed that glycosylation of Asn-442 is important for the secretion of N-terminal ectodomain of TLR2. Literature review illustrated that TLR2 cooperates with LY96 in order to mediate innate immune response. It also cooperates with TLR1 in order to mediate the innate immune response to bacterial lipoproteins or lipopeptides. Some of the alternative names for TLR2 are: Toll-like receptor 2, Toll/interleukin-1 receptor-like protein 4, TIL4 and CD282. TLR2 acts via MYD88 and TRAF6 thereby leading to NF-kappa-B activation, cytokine secretion, and the inflammatory response. This TLR2 may also promote apoptosis in response to lipoproteins. DNA viruses such as HCMV, Lymphocytic Choriomeningitis Virus (LCMV), Vaccinia Virus (VACV), Respiratory Syncytial Virus (RSV), Hepatitis C Virus (HCV) and Herpes Simplex Virus (HSV) are at least partially dependent on TLR2 (23-26). Heggelund et al. identified that among patients with HIV, freshly isolated monocytes expressed significant level of TLR2 compared to TLR4 (27). Further investigation revealed that elevated surface expression level of TLR2 was associated with stimulation via HIV type 1 envelope protein gp120. It was further confirmed that TLR2 stimulation in such patients, tends to promote TNF-alpha responses and viral replications (27). Hernandez et al. reported that HIV type 1 infection causes upregulation of TLR2 expression in both in-vitro and in-vivo conditions (28). There exists interplay between hepatitis B virus (HBV) and TLR2-mediated innate immune responses. The study proposed that restoration of TLR2 functions could be possibly used as a new therapeutic option (29). In absence of hepatitis B envelop antigen (HBeAg), the viral replication is significantly associated with increased activation of TLR2 mediated pathway which leads to up regulation of TNF-alpha. There exists an important interaction between host immune responses, HBV, and HBeAg. It has been reported that when Toll-like receptor-2 agonist Pam2Cys was intranasally administered, it triggered a cascade of innate immune signals and inflammatory cytokines which resulted in macrophages and neutrophils attraction, and further leading to secretion of TNF-α, IFN-γ, MCP-1, IL-10, IL-6 and IL-2. Such events significantly reduced the potential for transmission of infection via promoting resistant strategies against Influenza-A virus. It did not affect host generated adaptive immune response measured by identifying virus-specific CD8 (+) T cells after exposing to influenza A (30). Cuevas et al. while working on Junín Virus (JUNV), and induced innate immune responses, reported TLR2 as a cellular sensor of both the Candid 1 and Parodi viral glycoproteins (31). A study conducted on RSV reveled possible anti-viral responses generated via TLR2. Anti- RSV cytokine production was dependent upon TLR2/6 hetero-dimerization; while TLR2–RSV interactions were involved in dendritic cells activation and neutrophil migration (32). Initially, TLR2 was found responsible for sensing vaccinia virus infection on bone marrow-derived dendritic cells (DCs). The release of pro-inflammatory cytokine was found TLR2 dependent, while type I interferon production was found TLR2 independent (33). TLR2 is found to be associated with HCV immune evasion mechanism. It is reported that among chronic HCV infections, the HCV core protein induces cytokine production (TNF-α and IL-10) from macrophages. Production of such cytokines reduces the interferon alpha release from plasmacytoid dendritic cells or may induce apoptosis of plasmacytoid dendritic cells. In patients clinical aspects, administration of interferon alpha could provide protection against HCV infection (34). In humans monocytes and HEK-293s human fibroblasts experiments were performed to identify TLR association with viruses. The results indicated an association between HCV, EBV, and HCMV with human TLR2 via core protein NS3, unknown and envelop proteins B and H respectively. Similarly, results of experiments on HEK-293revealed that HCMV associates with TLR1/TLR2 possibly via envelop proteins B and H (Boehme et al.). It is reported that three HCV proteins including core (C), nonstructural 3/4 (NS3/4) and nonstructural 5A (NS5A) are closely associated with two important signaling pathways (i.e. TLRs related signaling pathway and RNA helicase retinoic acid inducible gene-I associated signaling pathway). The HCV core protein, only in its monomeric form, is associated with TLR2 signaling pathway. This interaction facilitates HCV innate immune evasion. HCV NS3/4A is associated with disruption of RIG-1 and TLR 3 signaling pathways. HCV NS5A down regulates NKG2D expressions in natural killer cells (NK cells) thereby resulting in functional disability. It is reported that when HCV core protein was expressed in HEK 293 and Mono Mac 6 MM6 human monocytic cell line, there was a significant increase in IL-6 and IL-8 levels via TLR 2 pathway. It was further revealed that MyD88 deficient spleen cells were unable to produce IL-6 after the expression of HCV core protein. These findings illustrated the importance of TLR2 associated signaling defects such as MyD88 as downstream effector molecules of TLR2 signaling pathway (35). Authors’ Contributions: Umar Saeed reviewed the literature and wrote manuscript. Sobia Mazoor is supervisor of Umar Saeed Nasir Jalal revised the manuscript and approved the study. Zahra Zahid Piracha helped in data manipulation.